Stroylines abound as the WWE is prepping to head "to the land Down Under." Who comes out of the Cell with the Gold? Find out here. With the WWE focused on new territories to conquer, tonight they return to one of their most iconic structures in their history. 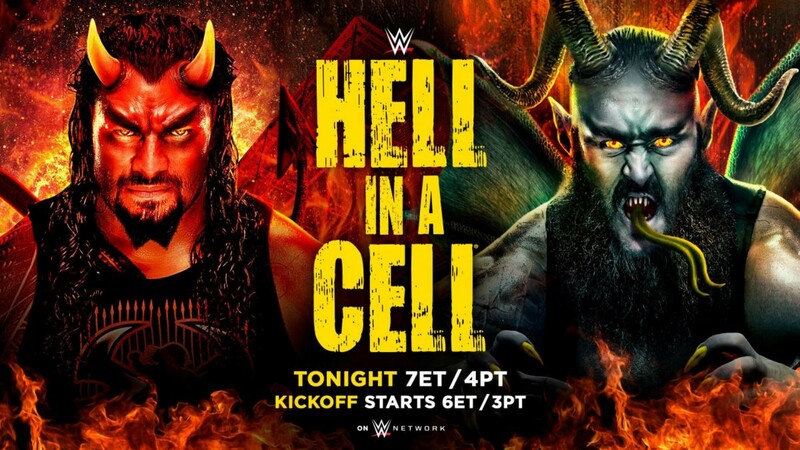 With The Super Show-Down and Evolution on the periphery, Hell In a Cell will air on Pay-Per-View and on the WWE Network on Sunday, September 16th, live from San Antonio, Texas. Questions will be answered in this one. Does Braun join the dubious list of failed cash-in MITB winners? Is it finally Samoa Joe, Becky Lynch, and the team of Dolph and Drew’s time to run with the ball? There have been rumors of a want to leave by all three members of Rusev Day. There is a growing resentment of the New Day and their breakfast food shenanigans. It would make sense for the New Day to drop the belts here. Rusev and Aiden English are becoming more and more over each week. The New Day will lose nothing and could still flip pancakes at ringside. The Freebird Rule could be used here, but it shouldn’t make any difference. This match will not be in the Cell. This match doesn’t need it to be. These two men might be the best performers in the Main Event scene in the WWE. Between the punishing nature of Samoa Joe and the sheer, unadulterated talent of A.J., this does not have the potential to be the best match on the card. This WILL be the best match on the card. The winner is almost irrelevant. The only question I have is where can I buy Joe’s storybook? Well, maybe there is one more. How much does Impact hate the fact that two of the biggest stars in their history are the biggest stars for the company that will eventually put them out of business? My pick: Your Winner BY DISQUALIFICATION and STILL WWE Champion, A…J…Styles! One of the most beautiful women in wrestling takes on one of the most brutal, and equally as stunning, women in wrestling. Bliss is dwarfed by Rousey, but experience is heavily in favor of Bliss. It is a mash-up of two worlds. Eric Bischoff spoke on one of the episodes of the 83 Week podcast and said the most intriguing thing is watching the face chase the title, not watching the face hold it. I agree with “Uncle Eric.” Bliss is far better as a smarmy Champ and Rousey chasing her and her narrowly escaping will be the perfect thing to run with. My pick: Your Winner and NEW WWE Raw Women’s Champion, Alexa Bliss! There is no one better holding a belt than Bliss. Not to mention, a loss by Rousey might set up a match between her and someone like Nia Jax while Bliss could take on someone else to keep the division somewhat fresh. This match is woven into the very fabric of the Main Event. With Survivor Series rounding the corner, I anticipate a match for that show to have Braun, DZ, and DM on one side with the Shield on the other. Throw in Finn, Corbin, and a few cruiserweights to round things out. I’d watch that Survivor Series match. But back to the task at hand. Picking this one is like picking the weather this time of the year or picking the path of a hurricane. Given what I just wrote about the match above, I believe the same thing will happen. While this is not over between these four, or six, men, Rollins will not be a double champ, and the WWE needs to have him free for an IC Title feud. My Pick: Your Winners by disqualification, Seth Rollins and Dean Ambrose, BUT STILL WWE Raw Tag Team Champions, Dolph Ziggler and Drew McIntyre. Here is a nice time to take a bathroom break. While this should be a good appetizer for the eventual solo match between D-Bry and the Miz, don’t expect greatness in this one. Maryse hasn’t been in a meaningful match in seven years, and just had a baby three months ago. Not to mention, there might be three good vertebrae between the couple in the opposite corner. My pick: Your Winners of this match, Daniel Bryan and Brie Bella. While Monday Night Raw might have the bigger and more eye-popping names, the promos on Smackdown the last month or two have blown Raw out of the water. Becky and Charlotte have been fantastic on the mic. It has breathed new life into Becky’s career, and has given the women’s division of the Blue Brand some edge and bite. My pick: Your Winner of this match, and NEW WWE Smackdown Women’s Champion, Becky Lynch. Jeff Hardy vs Randy Orton in the Hell in a Cell match. If there ever was a definition of a nostalgia match, this is it. Jeff has been one of (to borrow a phrase from a former Real-World cast member) “the most must-see” WWE wrestlers for the last 20 years. Orton has been one of the most successful singles wrestlers in the WWE in the last 20 years. 10 years ago, this would headline a WrestleMania. Right now, it is in the palette cleanser spot before the Main Event. It is possible these two could turn back the clock and give us something stellar. Both men have more talent in the bead of sweat on their brow than I will have at anything. However, this match is five years too late. It will be decent, but there will be at least one botch. This match is in the Cell. Hardy will either fly into it, off it, or some combination of both. We will see something shocking but look at the calendar. It is getting late in the year, which means it is getting to be that Randy Orton time of the year. My pick: Your Winner of this match, Randy Orton. Braun Strowman vs Roman Reigns in the Hell in a Cell for the WWE Universal Championship with Mick Foley as Special Referee. This is Strowman’s Money in the Bank Cash-In. Odds the crowd cheers for the wrong wrestler: None given due to this happening guaranteed. Notice how long that title is. It’s a Championship Match. It’s in a special structure. It has a special referee, and to add even more importance, they are cashing in the MITB contract here. The WWE is throwing everything behind this to get the fans to care. Let’s examine this further. In the history of the MITB, only three winners have failed to turn it into a Championship (I am counting Mr. Kennedy since he won the match but lost the contract before he could cash in. The other two were John Cena and Damien Sandow. You’re Welcome.). The MITB is almost a lock. The fans believe the WWE will eventually listen to them and that this is Braun’s time. Foley and Reigns have no love lost between them. Reigns locked in the Cell without with the rest of the Shield to help. All signs point to a victory for Braun. That won’t happen. Roman will win this. I have been a staunch supporter of Vince McMahon throughout the years. Roman as Champion keeps Braun as an angry monster, keeps the Shield together to protect Roman from Braun and his guys, and makes people want to watch the next encounter when Roman will surely lose to Braun. Either that, or Vince enjoys doing things to purposely tick his fans off. Normally, at the end of a major show, especially in a market like San Antonio, the good guys will win the match to send the crowd home happy. There is one problem with that. Who is the good guy here? I expect the internet to be all kinds of up in arms over the ending to this show. My pick: Your Winner of this Match, and STILL WWE Universal Champion: Roman Reigns. What are your thoughts on these picks? Are the odds wrong? Let us know in the comments.